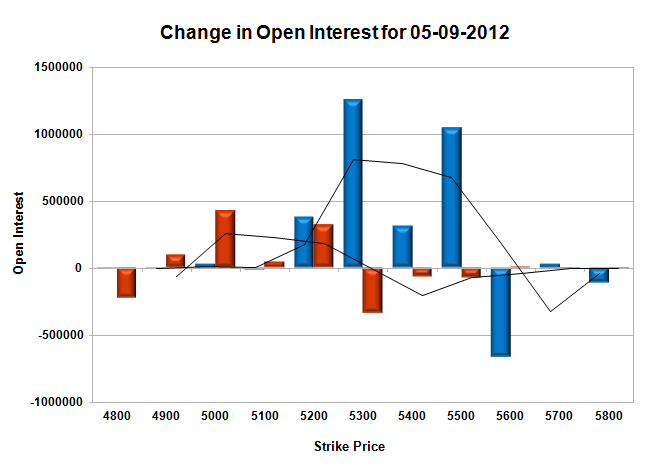 Nifty opened weak to be sold-off from the morning itself with not much buying seen. The Index closed the day near the lows at 5225.70 a huge loss of 48.30 points. The Option Table is hugely tilted towards the Bears with 5300 level captured today with much to spare. Call option 5200-5500 added 29.93 lacs huge amount of OI, with small profit booking seen at 5600 and above strike prices. Put Option 5200-4900 added 8.87 lacs huge amount of OI, with liquidation seen at 5300 and above strike prices. 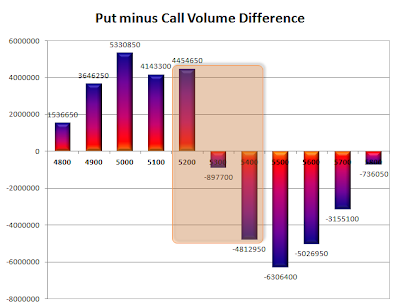 Highest accumulation on Call option 5500 at 73.1 lacs & 5400 at 65.6 lacs whereas Put option 5200 at 69.1 lacs & 5000 at 60.1 lacs. 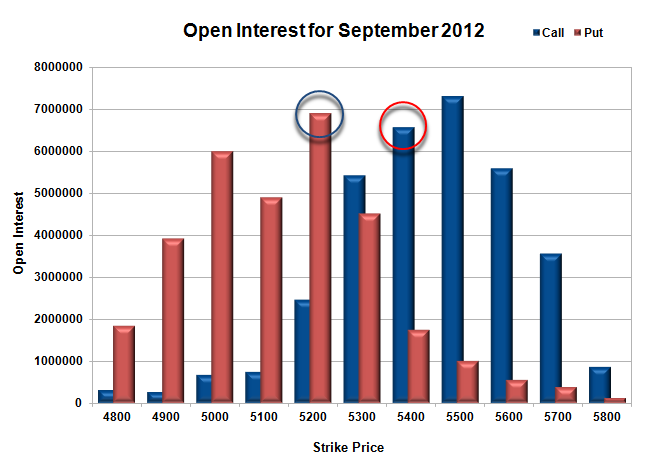 Nifty Open Interest is at 1,87,51,000 down by 1,75,400 with decrease in price, most probably long liquidation. 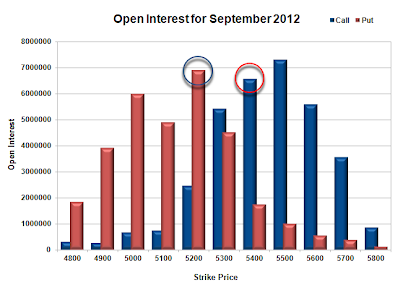 Bank Nifty Open Interest is at 17,20,125 up by 1,49,275 with decrease in price, most probably huge short build-up. FII’s sold huge 9.47 lacs Futures, most probably long liquidation with some short addition as their net OI just increased by 1.64 lacs, and their average price per contract comes to around 5153. FII’s future open contract as on date is 3.82 lacs. PCR Open Interest (Volume) is down below 1 for the first time in the series at 0.971. 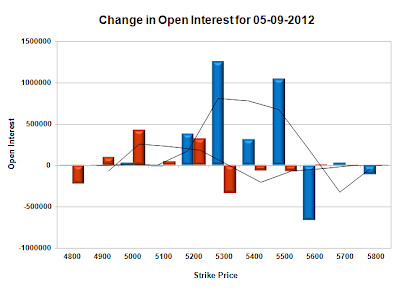 Nifty closed nearer to 5200 but the support is still very strong with OI of 69.1 lacs and below that at 5100-5000. Initial resistance at 5300 with huge addition for the day at 12.5 lacs and above that at 5400 and 5500 with highest OI of 73.1 lacs. 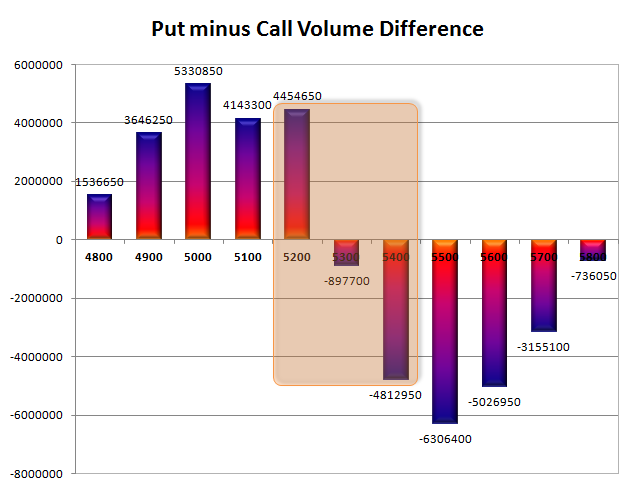 Range as per Option Table is 5189 -5276 and as per VIX is 5179 - 5272 with 5240 as the Pivot.